I learned to crochet as a teenager, from my older sister (who's a better knitter than I will ever be and also better at crochet. But I'm better at quilting, which doesn't interest her at all: we each have our pecularities). 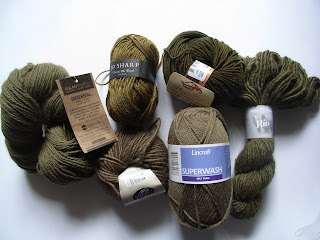 Granny stash: olive/chartreuse greens (and friends). I remember a small throw, granny square round and round (except it was rectangular, because I botched the middle), in Patons Totem 8 ply worsted whatever that I would probably have bought from a Diskins wool shop, because back then there were Diskins wool shops. I used it on my bed, and I remember that though it was only about 3 feet by 2 feet, it was suprisingly warm on cold feet, despite the holes. I think I also made a 'vest' of granny squares - bright colours edged with black, the front probably 3x3 squares, joined over the shoulder by two strips of squares - you know the kind of thing, I'm sure. Not hard to find in the late 1970s/early 1980s. 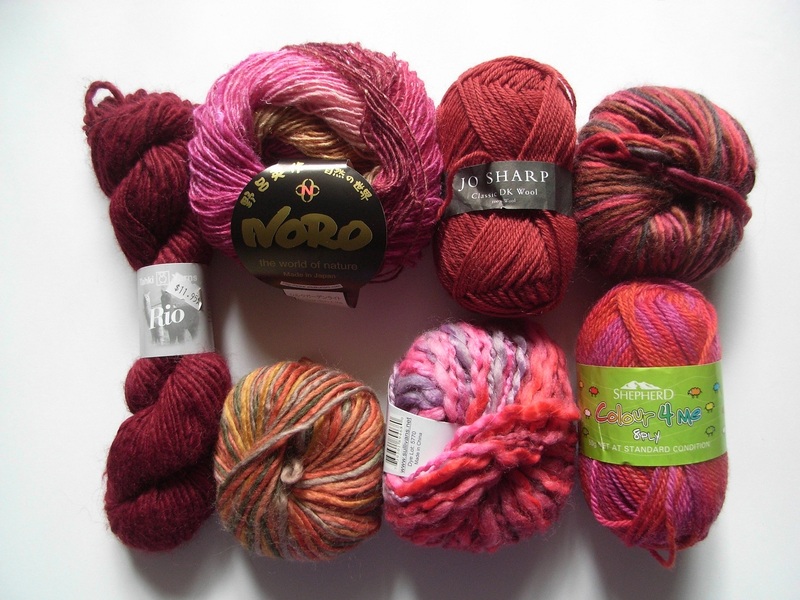 As a girl I also learned a bunch of other needlecrafts - tapestry, dressmaking, knitting, patchwork, quilting. And I've pottered about with various ones over the years since. Perhaps inspired by the blogosphere, and people's gorgeous photos of what they're doing, on blogs like Alicia's Posy Gets Cozy and Lucy's Attic 24, and having recently nearly finished a tapestry/needlepoint (more about that another time) - and also being required to spend significant amounts of time resting the most inconvenient sprained ankle... 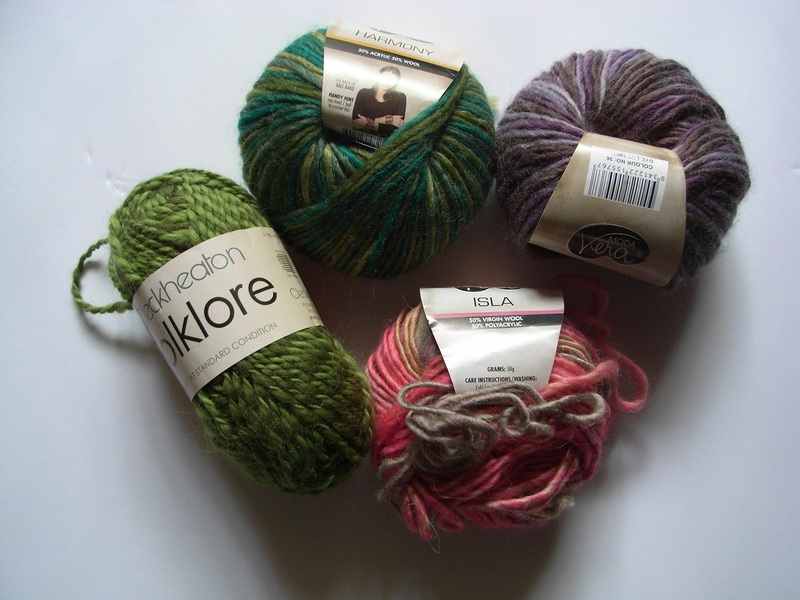 I acquired some wool/yarn and a crochet hook. I've also been reading Mollie Makes magazine via Zinio (as a digital magazine) and it has crochet in it too. It's thirty years, give or take, since I last crocheted anything of consequence. My fingers haven't forgotten - the turn of yarn over my left pinky, the raised left finger over which it travels, the right hand wielding the crochet hook. 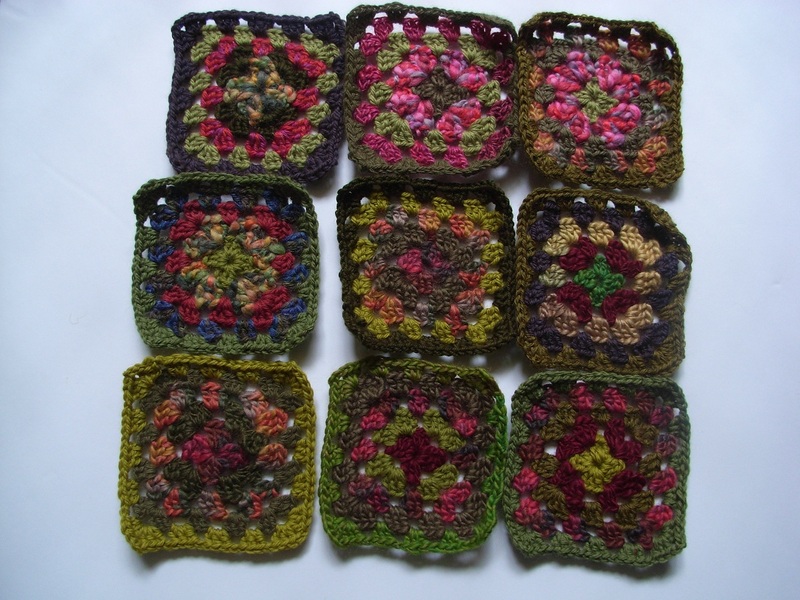 And granny squares. Easy, simple (and not yet blocked, so they have a bit of a curly look which blocking will fix), portable. Alicia's granny square throw is here as a work in progress, Scandinavian-cool yet warm; one of Lucy's granny throws here, with clearer, brighter Kaffe Fassett kind of colours. 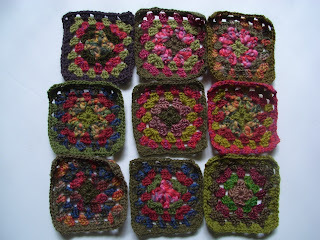 You can finish a granny square, and feel a glow of satisfaction, and then start another and play with more colours. I found myself choosing the wool like a quilter, by colour and the interplay of colour. Definitely wanted some variegated ones. Kinda knew I was working to an impressionist Rose Garden theme - burgundy to pink, greens in the olive/chartreuse spectrum, some olivey greens that ended up including some mouse browns. And a little purple. Tried this wool with that. Aimed for slightly murky rather than clear colours. Bought some that were close in colour, because I like that slight shift for the eye. Gave the wool shop lady slight conniptions by not actually being entirely bothered if every wool wasn't exactly the same - they're mostly DK weight, 8 ply or so, but a couple shade up to around 10 ply. I'm tending to use the thickest ones in rows one/two/three so they have less impact on the final size of each granny square. The composition of them ranges from 100% wool to mixes which include combinations of wool with alpaca, mohair, silk (and a little acrylic, when it was a yarn that I just had to have). I'm thinking of making some of the squares four times the size, so I can have one big square next to four smaller squares - fourpatch, in quilting talk. Less ends of threads to weave back in, fewer blocks to sew together and variety for the eye. At the moment I'm planning a blanket/afghan around 60 inches square. These blocks are around 5in square, so if I make them all small that's 144 blocks. If half of them are big, that's 72 little blocks and 18 large blocks. 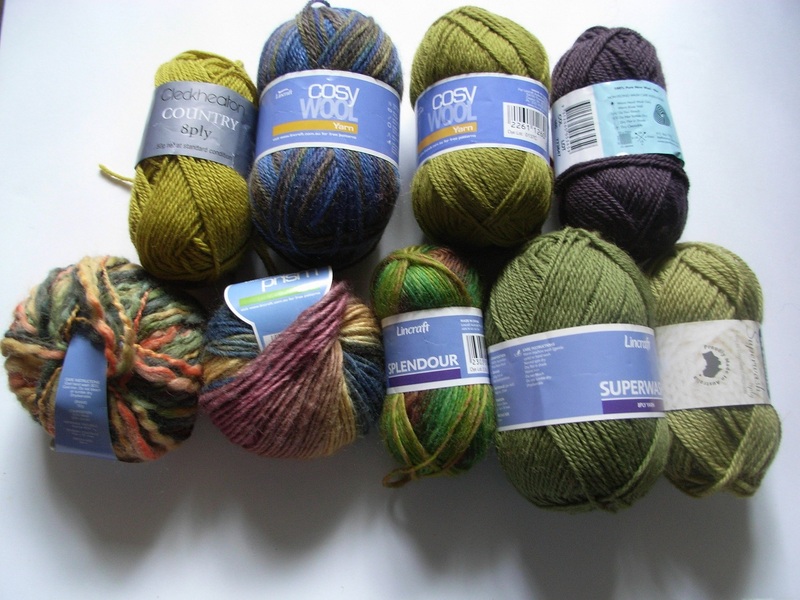 Don't know if I have enough wool, but if I don't, there's more in the shops... At present I have about 1.6kg, around 27 colours. Because just like when I'm quilting, I like a little of a lot of colours to play with. I'm aiming not to make the same colour combination twice. In the late afternoon, at this end of summer, the sunlight filters through the window by the big red sofa, and it's a peaceful and happy thing to be parked there (ankle on ottoman) with colour to play with, the rhythm of the needle and the wools growing into something more than the sum of their parts, stitch by stitch, afternoon by afternoon. And when winter comes, there will be a warm blanket there to wrap any occupant of the big red sofa. And what is finer than being able to have the work of your hands produce something that fits William Morris' dictum - useful and beautiful? I've also been exploring Ravelry, and have added this as a project there. There are a gazillion granny square patterns and tutorials out there to explore on blogs and YouTube and Ravelry. I'm using mostly DK/8 ply yarns, and a size 5mm crochet hook (it's a nice shiny slippery metal one from the local wool/yarn shop, labelled Boye brand and H/8 - 5.00mm, and its slippery shine makes it easier to use than grey metal or plastic, I'm finding). 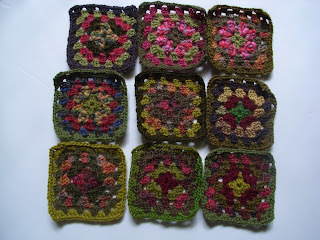 Purl Bee has a good tutorial on granny squares here, and Pip Lincolne at Meet Me at Mikes has Granny Squares 101 here. There are granny-a-day groups too, and lots of various patterns based on the granny square. I'm going plain vanilla, the chain centre and trebles. When I finish this, I have my eye on two other ideas from Lucy at Attic 24. This gorgeous Japanese flower scarf and this charming retro blooming flower cushion. But for now, I'm grannying, inspired by crochet from Portland in the Pacific Northwest, the Yorkshire Dales, New York and Melbourne. Bless the internet for the crafting inspiration you can find. Aren't those squares lovely? Well done! I cannot get the hang of crochet. I keep trying to use the hook as I would a knitting needle. Need to practise more so that the movements are committed to muscle memory. Those colours are SO Kaffe. Gorgeous.